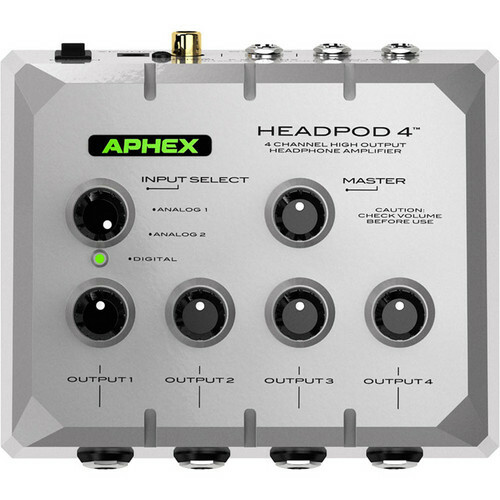 The Headpod 4 High-Output 4-Channel Headphone Amplifier from Aphex is a professional-quality headphone amplifier that allows 4 people to listen to the same audio signal. Ideal for computer-based applications, broadcasting, FOH, voiceovers, on-location recording, post-production, and more the Headpod 4 has a compact and durable metal housing that withstands the rigors of day-to-day professional use. The unit has 4 independent stereo amplifier circuits and 4 1/4" headphone outputs, each with its own volume control. A master volume control is also provided to match your source level. A single stereo 1/4" input jack, as well as 2 individual mono 1/4" input jacks for left and right are provided for inputting your signal. A coaxial S/PDIF input allows the unit to accept a digital signal. The Headpod 4 works from any analog source and a variety of digital sources and overcomes the limitations of typical headphone outputs. It offers high headroom, low distortion, and low crosstalk so you can have long listening sessions without fatigue. Listeners can enjoy clean, undistorted audio at any level. Since the unit does not place a load on your existing headphone output, the Headpod 4 actually improves your audio quality. Box Dimensions (LxWxH) 8.8 x 7.3 x 5.1"
Headpod 4 High-Output 4-Channel Headphone Amplifier is rated 4.0 out of 5 by 1. Rated 4 out of 5 by Alex from Clean The amp is powerful and the sound is clean i.e does not color the sound fed into it. would be great to have battery option.